New Years day is a new beginning. It’s a day to look back over the past year, see where we’ve been and take stock. Then, to look ahead, and see where we want to go. Coming off of the craziness of the December holidays, New Years Day is a time for me to slow down and reassess. That goes for food as well. I love tying my recipes to themes and holidays, and New Year’s give me a chance to do that too. 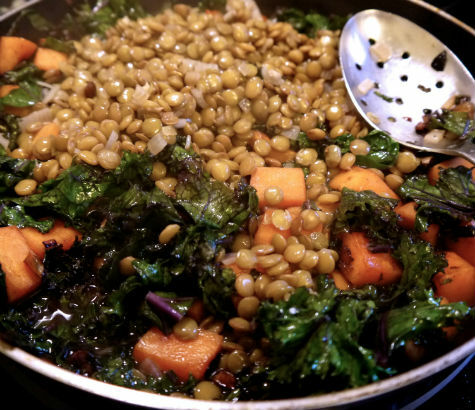 Did you know that eating lentils and leafy greens are considered lucky? 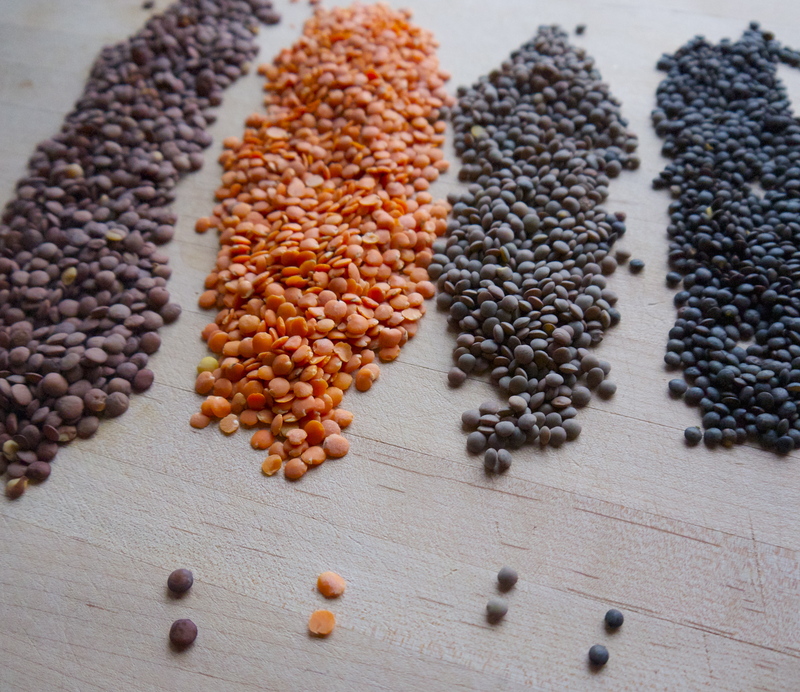 Lentils represent coins, and leafy greens, paper money. Add pork to that, also considered lucky, and you have a stellar dish to ring in the new year. 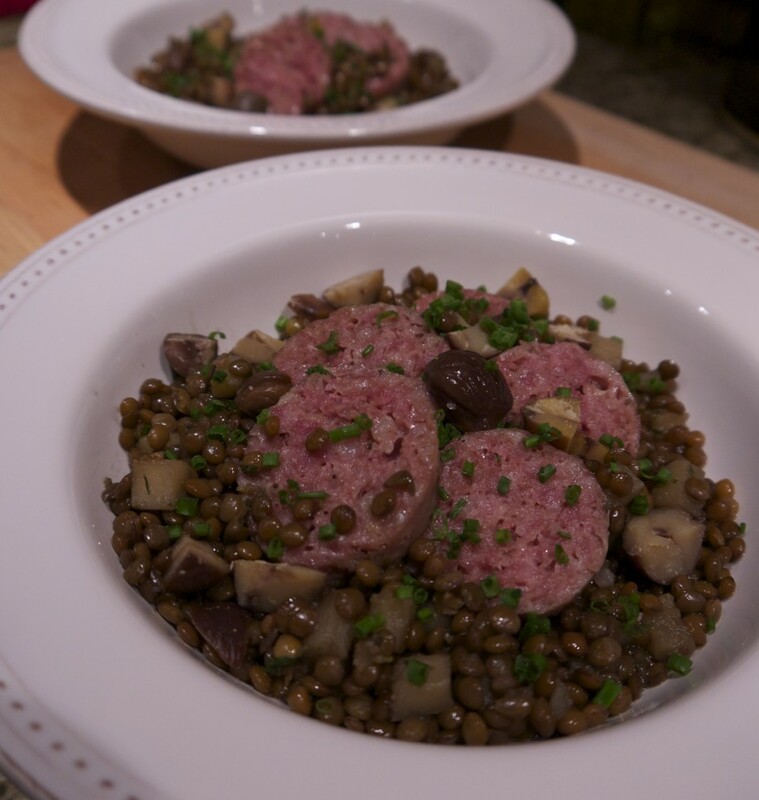 Last year I wrote about a traditional Italian dish called Cotechino con Lenticchie, considered very lucky in Italy, and eaten on New Years. I gave it a little revamp with kale and chorizo and have a spectacular idea for your New Years dinner table this year. A few thoughts on the ingredients I used: The sausage I used was fresh chorizo. Smoked chorizo would work well in its place, if you have that on hand. 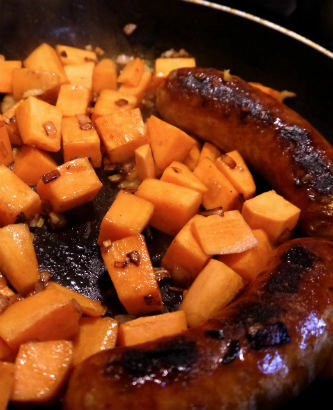 You can easily make this a vegan/vegetarian dish by leaving out the sausage. Just add a pinch of chili flakes to the onion while it cooks. Sweet potatoes or yams are the way to go. You need a little sweetness to balance the spicy sausage. Plus, they will cook up a little faster than a regular potato. Lentils come in a variety of shapes and colors, and for this dish I used the traditional pale green variety, because that is what I had on hand. Black or dark green baby lentils will work perfectly here as well. In fact could be easier. I was concerned that my traditional lentils would over cook so I was checking them constantly! 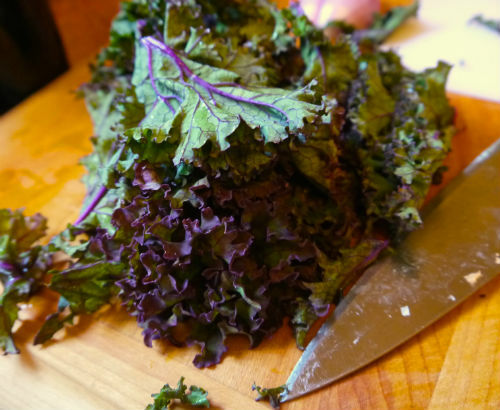 If you are not a kale lover any sturdy leafy green will be fine. Spinach or chard will work nicely. Start to finish the dish came together in about 40 minutes. As things cooked I was prepping and cooking the other ingredients. You can also make this ahead, cool it down and rewarm for later. It’s a perfect dish for lunch or to serve on a buffet with dinner. 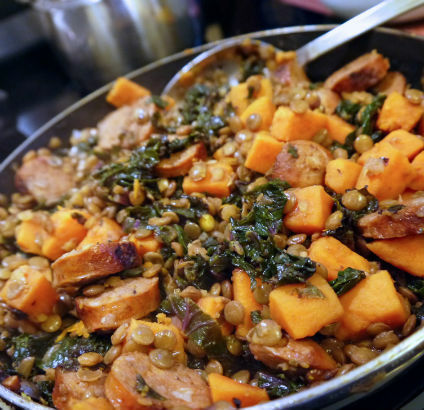 Click this link for the recipe: Lentils with Chorizo and Sweet Potato. Best wishes to you and your family for a happy and prosperous 2015!